There are three formats for the 2017 IEEE International Symposium on Antennas and Propagation and North American Radio Science Meeting: Interactive Forum (Posters), Oral, and Student Paper Competition (SPC) poster presentations. If you do not know the particular format for your paper, please consult the advance program. Guidelines for interactive forum, oral, and SPC poster presentations are given below. Every accepted paper must be linked to a registered person by April 6, 2018. Any paper not linked to a registered person by April 6, 2018 will be withdrawn from the technical program and proceedings. If you are unable to present your paper personally, please arrange for someone else to present it. If no one is available to present your work, you must notify the Technical Program Co-chairs as soon as possible (papers@2018apsursi.org) so that it can be withdrawn. As per IEEE directives, papers that are not presented will not be included in the conference proceedings on IEEE Xplore. The venue for the Interactive Forum sessions will be Galleria Exhibit Hall. Rectangular boards will be provided, with the face divided in half. 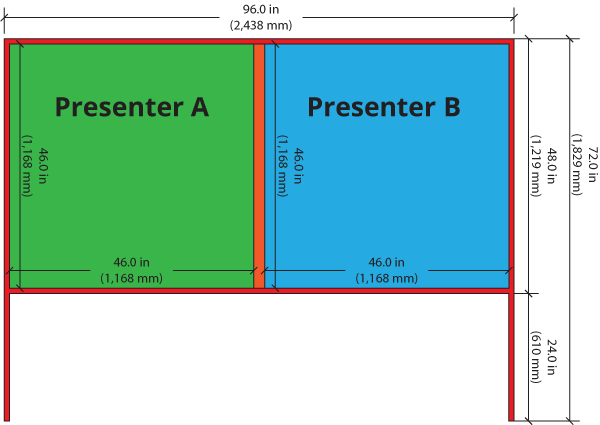 The usable area for a single presenter is 46 in. (1168mm) tall and 46 in. (1168mm) wide. The poster is not required to fill this entire space; Posters MAY NOT EXCEED 46 in. (1168mm) WIDTH OR 46 in. (1168mm) HEIGHT. Push pins or other attachment methods will be provided. Note, however, that THERE WILL BE NO ACCESS TO ELECTRIC OUTLETS. Thus, your laptop should be fully charged if you want to use it as part of your presentation. The boards will be arranged in rows. Each reserved paper space will be assigned a number. Every paper being presented at the same time will also be assigned a number. The number, called the Board Number, will identify the place to post your poster. Your poster presentation should be easily readable from 1.5 to 2 m (5 to 7 feet) away because people will view it standing or as they are walking by. A sans-serif font is recommended with title fonts a minimum of 48 points, author and affiliation fonts 40 points, and text fonts 28 points. Table and figure captions, references, and acknowledgments can have smaller font sizes. A PDF tutorial on using PowerPoint to create a poster is available here. Important points should be highlighted and arranged in a clear sequence. Graphical elements take on increased significance in the poster format and should be utilized accordingly. Do not simply reproduce your paper in large type. Poster sheets are usually arranged to be viewed from left to right and from top to bottom for an attractive and logical flow of information. If more than one page or sheet is used, it is recommended that these be numbered in the order in which the authors wish them to be viewed. Colored tape used to connect the units can be a helpful guide for the reader. Plan your story before you begin. Headings should be in uppercase and lowercase, not all capitals. Do not use capitals or underlining to stress your point; use boldface font instead. Leave "breathing space" around your text. Don't overcrowd your poster. Try using photos or color graphs. Avoid long tables or long text blocks. Spell check and proofread your poster. Whenever possible, attach legends directly to your plots rather than using a legend box somewhere in the frame. The session chair(s) for your session will have a Feedback Form where they will mark whether or not your paper was presented during the session. If the form indicates that the paper was not presented, it will be automatically withdrawn from appearing in IEEE Xplore. Thus, during your session, please approach the session chair and make sure that he/she has marked your presence. All oral presentations have been allocated a 20-minute time slot. These 20-minutes must include the presentation, questions, any discussion, and the transition to the next presentation. It is strongly recommended that speakers plan on a 15-16 minute presentation to allow 4-5 minutes for questions; speakers typically cover at most one to two slides per minute. Each room will be equipped with a personal computer running Microsoft Windows XP, Microsoft Office 2007, Adobe Acrobat Reader, Flash (to handle Flash animations), and Microsoft PowerPoint Viewer 2007. The presentations must be produced and ready to use in at least one of these formats. The room will have a projection screen, and the computer will be connected to an appropriate LCD projector. Authors should ensure that their presentations are loaded onto the computer in their assigned room 15 minutes before the beginning of the session. A speaker preparation room (with an appropriate personal computer) will be available in the Fraser room of the Westin for authors to check their presentations. All papers must be presented in person at the symposium in order to be included in the proceedings published in IEEE Xplore. The preferred method of running a PowerPoint presentation will be through PowerPoint Viewer 2007. This should properly display any presentation created using PowerPoint version 97 or later. You must make sure that your presentation contains all of the fonts and any auxiliary or multimedia files needed, and that these files will be in the right place on the projection machine. The best way to do this is to through the use of the PowerPoint's "Pack and Go" (PowerPoint 2000) or "Package for CD" (PowerPoint 2003 and later) capability (hereinafter called the "package capability"). This is available in PowerPoint 2000 under File...Pack and Go, or in later versions under File...Package for CD. For a tutorial on using "Package for CD," see http://support.microsoft.com/kb/828504. Note that "Package for CD" can also be used to create a "package" file, which can then be copied onto a flash memory stick. One of the advantages of the package capability is that you can include all the fonts used by your presentation. This avoids the problem of a font that is used in your presentation not being present on the display computer. It is strongly suggested that you take your "packaged" presentation to another computer, and practice unpacking it and showing the presentation, just to make sure that the "packaged" presentation contains everything you need and that you are familiar with the process. You should also make sure that any and all graphics, multimedia, or other files used by your presentation are included with your presentation. Once you get to the Conference, you are strongly urged to use the computer in the speaker preparation room to check your presentation. Even if you do not have any multimedia effects or use auxiliary files, font incompatibilities, different resolutions for the projector, and differences in standard formats used around the world very commonly cause problems. You will not be given extra time during your presentation to solve such problems. Presentations can be loaded onto the computers in the session rooms via either CD-ROM or USB flash memory stick. It is requested that you do not use a U3-enabled flash memory stick (for example, most recent SanDisk brand memory sticks are U3 enabled). In creating a CD-ROM for your presentation, please do so in a manner such that no special software is required to read the CD-ROM. For example, some popular CD-R software provides an option of creating a "data CD" or using "DirectCD." Create a data CD; do not use "DirectCD." Using the latter can lead to reading compatibility problems in some cases. Also, please be sure that your software is set to close the session when you finish recording the CD. Only CD-R drives (but not "regular" CD-ROM drives) can read CDs recorded with the session left open. It is strongly urged that you try reading the CD you have created on another computer (with a standard CD-ROM drive), in order to maximize the likelihood that the CD can be read by the presentation computers. Again, please test your method of loading the presentation in the speaker preparation room well before your session begins. When generating an Adobe PDF file of your presentation, please make sure that you embed all fonts. The normal TrueType or OpenType fonts installed with Windows XP and Office 2007 should be available on the projection computers. However, Adobe Type 1 fonts will probably not be available and, therefore, must be embedded if used. The use of Adobe Type 3 fonts (common in some installations of LaTex, for example) is strongly discouraged: such fonts do not scale well, and tend to produce very poor results when projected. As a last comment, please try to minimize any potential problems by taking advantage of redundancy whenever possible: save and bring your presentation in multiple formats (e.g., Microsoft PowerPoint and Adobe PDF), store your presentation in more than one media (e.g., a CD and a flash memory stick, etc. ), and hand carry your presentation during travel. Please note that if you choose not to create a PDF file with embedded fonts or not to make a PowerPoint "Package for CD" file, we cannot guarantee that issues regarding fonts, video formats, etc., will be resolvable on site. Note that all submissions to the Student Paper Competition (SPC) have been assigned to regular sessions (the submission may have been assigned to either an interactive forum or an oral session). Submissions which were selected for the SPC Poster Presentation will be presented twice: once in a regular session and once in the SPC Poster Presentation. The guidelines for presentation in a regular session are exactly as described above. Presentation in the SPC Poster Presentation differs from the Interactive Forum description given above only in that laptops are not permitted.